Carbon monoxide (CO) may be fatal when inhaled. It is the gas produced by all thermal gasoline driven engines. 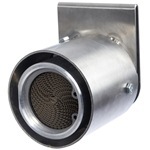 In association with specialists in engineering of exhaust fumes treatment, LEADER has developed its CO reducer "LEADER Cat" and offers the possibility to equip its own fans. During fire fighting operations using gasoline driven LEADER fans, LEADER Cat allows safe entry as it cancels CO dangers and ensures a CO rate lower than 30 PPM with a fan positioned at 3 m (9.8 ft) from a simple opened door (results under max level of OSHA safety standards). 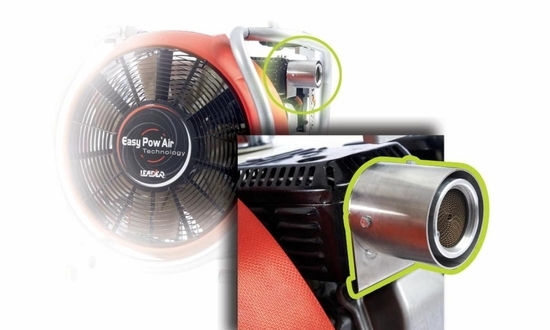 The studies have shown that the blowing Easy Pow'Air Technology performances combined to those of the CO reducer confer to LEADER fans an excellent ratio "Rate of produced CO / Volume of air blown". Up to 80%* reduction of the CO produced by Honda GX160 and GX200 engines. It mounts easily on all GX160 and GX200 Honda engines. Performant with any unleaded fuels. Compatible with the exhaust extensions.